I am Chris Robinson and I am an L.A. Wedding Officiant. I can officiate your wedding anywhere in Los Angeles County or Orange County. I have been a wedding officiant since 1993. I am also a specialized notary so I can issue a marriage license to you so that you don’t have to wait in the Los Angeles County Clerk’s Office long lines before your wedding ceremony. And I happen to be an attorney as well so be assured that paperwork is second nature to me. I hand deliver your marriage license to the County Clerk’s office because I want to be thorough and make sure that it arrives. If you are from another country that requires one, I can also help you with your apostille. Gay weddings are now allowed in California and I would be happy to help. Please go to this page to read more. 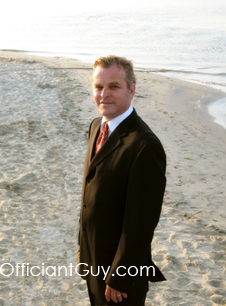 or click on Wedding Officiant Los Angeles to email me for information.